Designed for the drying of hops, an oast (or oast house) is an essential part of Kent history. Kent was famed for its hop-growing, and the demand for somewhere safe to dry (kiln) the hops for the thirsty brewers was high. How did an oast house work? 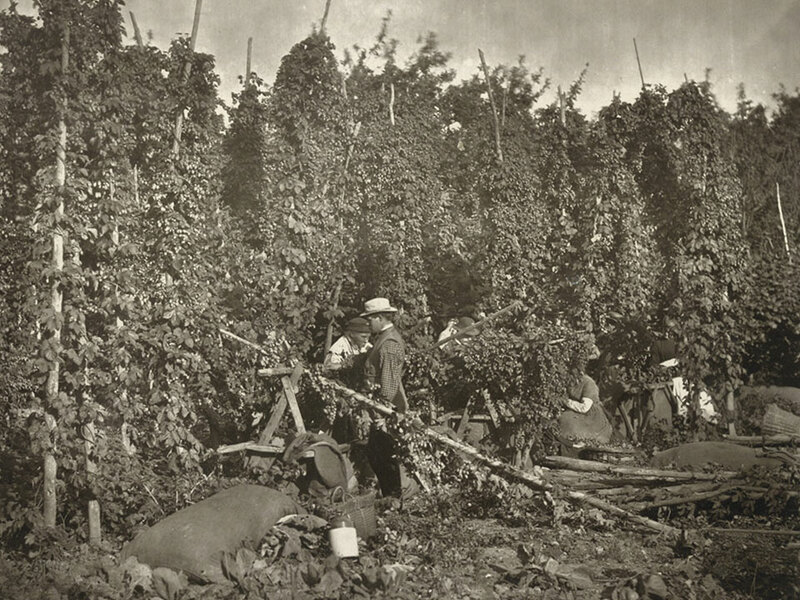 Green hops were picked in the hop gardens (for a set price per bushel), however when freshly picked they had a moisture content of 80% – this needed to be reduced all the way down to 6% to be any use for the all-important brewing. Traditional Kent oast houses were two or three storeys high with diagonally slatted floors (stowage). Hops were strewn out across these thin drying floors and heated from below – the slats allowed the heat to gently rise through them decreasing the moisture content. Topped by anywhere between one and eight circular kilns, the oast cowls that we so lovingly construct and restore provided ventilation for the hot air from the wood or charcoal fires below to escape. They were cleverly designed to swing away from the prevailing wind and therefore create a vacuum that kept hot air being drawn through the slatted floors above. The hops were then left to cool before being bagged up into large jute sacks called ‘pockets’ with a hop press. Each pocket contained about 150 bushels of green hops! Most importantly, the pocket had to be marked with the grower’s details. The brewers at the market would want to know for certain, where their hops were coming from, as they were used in their breweries to add distinct flavour and character to the Kent beers we know and love. Starting our business in 1937 it’s no wonder we know these oast and oast cowls inside out. We are really proud of our part in maintaining this important part of Kent life. If you want to see a traditional oast house in Kent, one of the best preserved is The Hop Farm Country Park at Beltring. Famous for having the world’s largest collection of Victorian Oast Houses it has been our honour to work on this project. If you have any questions about oast houses in Kent then get in touch.